Concerns about warmer average temperatures, climate change, and international campaigns about environmental problems, from plastic pollution in the oceans to CO2 emissions, have brought up a new sensitivity on the environment as an important factor for development. Actually, climate change is exhibiting its negative effect on lifestyle and its effect on local economies as a result of adverse events such as droughts, floodings, and stormy and changeable weather. Hence, a new customer’s environmental sensitivity forced to ask brands for more ethical options. Environment is heading the list and companies are more and more engaged in marketing campaigns dedicated to demonstrating how their products fulfill green demands throughout the whole value chain, from raw material up to recycling after the end of the product’s life. Thus, environmental challenges are a marketing power to be used in advertising campaign to promote the product as well as an obligatory requisite in several national legislation. In recent times, the preference to look at green energy has played an important role in innovation in production as well as advertising, highlighting the effect of environmental challenges as a contribution to CO2 emissions and climate change reduction approaches. In fact, since 2015, major American and European brands such as Marks&Spencer, IKEA, ASDA, Walmart, have set a goal of using 100% of renewables, which positively influences their business from a business and marketing perspective. Walmart, which is a leading brand in the United States, announced that it has achieved 70 million kWh of renewable clean solar energy per year, which is consumed by 5400 homes on average. Being inspired by this green revolution, a group of EU companies and research centers have created the ComSos (Commercial-scale SOFC systems) project that aims to bring the benefits of zero emissions and fuel cell technology to the commercial sector. Actually, in the HORIZON2020 EU funded project, fuel-cell-based energy solutions are illustrated in real client environments, in collaboration with top European system experts. The project may enable manufacturers to leverage developing potential for serial manufacturing, sales, and marketing of Mini Fuel Cell Combined Heat and Power (Mini FC-CHP) products in the power ranges of 10–12 kW, 20–25 kW, and 50-60 kW. Every manufacturer will certify new product segments in cooperation with the particular customers, verify product performance, size, business case, and practically test the distribution channel including maintenance and service. On the basis of findings associated with the specific segments, the system will be ideal for volumes from a few 10s to many 1000 systems per year. In fact, the objective of the project is to strengthen the European SOFC industry’s world-leading position for SOFC products ranging from 10 to 60 kW. The ComSos project will employ 25 SOFC technology-based power generation solutions globally bringing the commercial sector to an unparalleled high efficiency and environment-friendly strategy to energy consumption. Marketable, ground-breaking, and energy-efficient SOFC applications are therefore rising from the project, which will offer obvious proof to the building sector, the commercial sector, and the general public of the main advantages of SOFC systems: modularity, zero emissions to atmosphere (NOx, SOx, PM, VOC), and high electrical efficiency (up to 60%, the highest attainable among competitors). Furthermore, for companies that are keen to know about this new green energy technology and wish to learn more, ComSos has updated its website with the most recent project news, and a contact form to reach additional information on how to join the Industrial Advisory Board in order to contribute to the project. 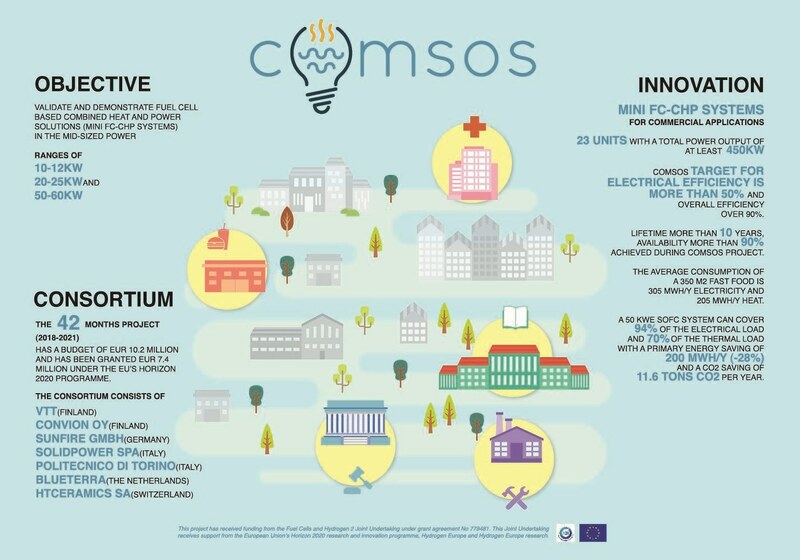 ComSos is a 42-months project (2018-2021) with a budget of €10.2 million and has been granted €7.4 million under the EU’s Horizon 2020 programme managed by FCH-JU. The project, managed by VTT, includes the following partners: Convion Oy (Finland), Sunfire GmbH (Germany), SOLIDpower SpA (Italy), Politecnico di Torino (Italy), Blueterra (The Netherlands), HTceramics SA (Switzerland). The Fuel Cells and Hydrogen 2 Joint Undertaking is funding ComSos under grant agreement No 779481. This Joint Undertaking is supported by the European Union’s Horizon 2020 research and innovation programme, Hydrogen Europe and Hydrogen Europe research.